Dunk Tank Rental | FroggyHops.com Minneapolis MN. 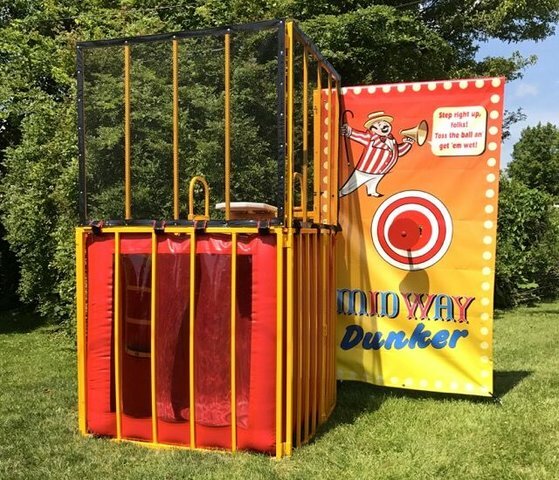 Setup Area: For safety, dunk tanks require a 10' x 10' flat area with a "Safety Zone" surrounding the back, sides, and front area. This area is to protect from over-thrown or deflected balls. Dunk tanks have been delighting crowds for over 70 years! The concept of dunking the boss at a company picnic or dunking the principal at a school carnival has become an American pasttime! The lucky (or unlucky) Dunkee climbs up the ladder entrance located on the back of the dunk tank and sit on the dunking board. The crowd waits in anticipation as participants of all ages and abilities get turns throwing balls at the 7 inch target. Once hit, the dunking board's "Sure-Release" Trigger Mechanism drops and the unlucky boss or principal or teacher into the water below with a splash! There is an easy-to-climb ladder with hand gribs to assist the soaking wet person climb back up out of the tank. Dunk tanks are fully assembled upon delivery. The only thing left for you to do is add the water!